Although techniques for treating periodontal (gum) disease can vary, they all boil down to one objective: remove the bacterial plaque and calculus (hardened plaque deposits) that cause the infection. The initial treatment usually involves two techniques known as scaling and root planing. Scaling uses hand instruments, ultrasonic equipment or a combination of both to manually remove plaque and calculus from the tooth and root surfaces. Root planing takes it a step further by minutely “shaving” infected material from the root surfaces. While more invasive techniques (including surgery) may be needed, scaling and root planing are the first line of treatment for any recent diagnosis of gum disease. In recent years, an adaptation to these treatments has emerged using the Nd: YAG laser. The laser uses a particular crystal that’s adaptable for many different types of surgery. In the case of gum disease, it’s been found as effective as traditional methods for removing the infected linings of periodontal pockets. Voids created by detaching gum tissues as bone loss occurs, enlarge the small natural gap between the teeth and gums, which fill with pus and other infected matter. Removing the diseased lining from these pockets reduces bacteria below the gum line and speeds healing. 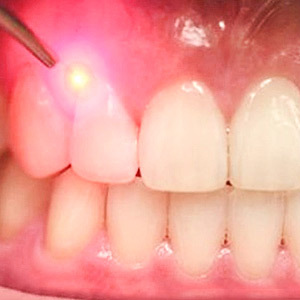 Periodontal laser therapy may have one advantage over traditional treatments: less tissue damage and swelling, and hence reduced post-treatment discomfort. While some research seems to confirm this, more controlled studies are needed to render a verdict on this claim. Regardless of whether you undergo traditional scaling and root planing or a laser alternative, the aim is the same — to bring the disease under control by removing plaque and calculus and reestablishing good daily oral hygiene practices. Stopping gum disease as soon as possible will help ensure you’ll have healthy teeth and gums for a long time.